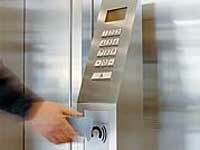 The ID human interface system from Schindler is a destination-based elevator technology intended for mid- and high-rise buildings. It is designed to customize service for each passenger using electronic identification badges. After identifying passengers using an electronically readable device, the system assigns an elevator car that meets their needs — including handicapped, VIP or limited-access passengers — and takes them to their destination, allowing or limiting access to various floors depending on building requirements.